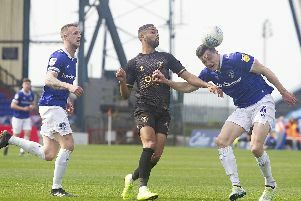 Teenage midfielder Joe Fitzpatrick made his full debut for Mansfield Town today as boss Adam Murray shook things up with six changes for the final home League Two game with Portsmouth. Also coming in were keeper Lenny Pidgeley, full-backs Callum Elder and Liam Marsden, and strike pair Rakish Bingham and Matt Rhead. Out from the side that lost 3-2 at Cambridge last weekend went Sasha Studer, Ricky Ravenhill, Lee Beevers, Vadaine Oliver, Michael Raynes and Terry Hawkridge. Young defender Corbin Shires was also included among the substitutes. STAGS: Pidgeley; Marsden, Sutton, Tafazolli, Elder; Thomas, Clements, Fitzpatrick, Brown; Bingham, Rhead. Subs: Studer, Hearn, Shires, McGuire, Lambe, Oliver, Heslop. PORTSMOUTH: Jones, Webster, Devera, Wallace, Ertl, Tubbs, Westcarr, Dunne, Hollands, Close, Butler. Subs: Poker, McCallam, Shorey, Fogden, Atangana, May, Chaplin. REFEREE: Graham Horwood of Luton.